Pop quiz! If your association is about to select a new AMS and plans to begin the implementation process in 3-4 months, when do you start thinking about change management? Change management is a part of project management, but it’s often overlooked. That was our message during the session: project management steps must be in sync with change management steps. 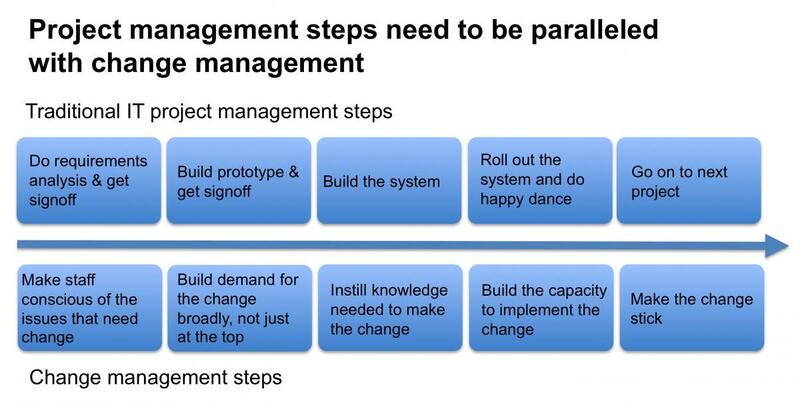 A CiteWorld graphic that René used in a presentation at the ASAE Technology Conference reveals the answer: D. Start change management during the first phase of project management: requirements gathering and analysis. Each phase of project management must coordinate with each phase of change management. You can’t wait until you’re getting ready to roll out a new system to start thinking about change management. By then, it’s far too late. When a project fails to live up to expectations, you can often trace the cause back to the project’s beginning. For example, requirements analysis, a critical project step, might have been done poorly or not at all. Or, as René pointed out, change management may not have been part of the project plan from the start. As you build a system, you also need to build the desire for that system and the capacity to adopt that system in the people who will interact with it. The bottom timeline in the graphic above illustrates the 5-step ADKAR change management model. Once the go-ahead is given and the project plan is developed, requirements analysis begins. During this project stage, staff stakeholders and business analysts identify and document the requirements for the new system as well as changes to business processes. Staff and project leaders must start communicating with staff about the need for change at the very beginning of the project. Some staff may not understand or agree with the need for change, so it’s crucial to listen carefully, address their concerns, answer questions, and squash misinformation and rumors. While the project moves onto the design phase, staff leaders must focus on building within the staff the desire to support the forthcoming change. At this point, staff should understand the reason for a new system, but now they want to know how the change is going to affect them. How will their business processes, procedures, and job descriptions change? Change is personal. You need to understand reasons for resistance to change and develop a plan for turning that resistance into support. As the system is being developed, you must help everyone develop the knowledge they need to make the required change. Some staff will only require training, but some will need more individual attention and coaching. This is an anxious and awkward time for those who aren’t used to learning new skills, so keep reminding them of the positive impact the new system will make on their job, the organization’s operations, and/or the membership experience. As the system is rolled out, your change management efforts focus on helping staff develop and practice the new skills and behavior required to sustain the change. To do this, you need to identify any logistical and cultural barriers that could prevent them from implementing the new system and/or processes. Are supervisors modeling the change you want to see? Is staff able to fall back on old methods of doing things? Has staff been given the necessary time to learn new skills and develop new workflows, or are they expected to add those responsibilities to their existing schedule? Are they being rushed too quickly? Even though a project may have come to a close, the change management process continues. You have to make the change stick. Change is sustained through ongoing coaching and training, opportunities for feedback, celebration of quick wins, and the demonstration of individual and collective progress. When you plan for change from the beginning of a new project, you can prevent most of the frustrations, complaints, and resistance that normally occur when change management isn’t synchronized with project management.